The Maryland Drivers Alliance has learned that speed camera citations issued by Montgomery County as well as some of the "daily setup logs" associated with some cameras contained systematic errors which went unnoticed and uncorrected for months and possibly years. The citation defect appears to affect all speed camera citations issued during the later part of 2012, all of 2013, and the first half of 2014. Under Maryland law, a defendant contesting a citation is permitted to request the presence of the speed monitoring system citation operator in court by sending a letter making the request at least 20 days prior to the hearing. However the backs of Montgomery County citation provide an incorrect address to which such requests are to be sent. In fact the instructions read: "Send this correspondence in an envelope marked “Operator Request” to: Montgomery County Customer Service at 1-866-579-5742"
Specifically telling the defendant to mail the "Operator Request" in an address addressed to a phone number. Any letter addressed as shown would not be delivered by the Post office. This defect apparently went unnoticed by Montgomery County Safe Speed during a period of many months. The citation template containing the erroneous information was approved by the District Court in 2012, and hundreds of thousands of citations were issued during that time without any employee of the Safe Speed program requesting that it be changed. 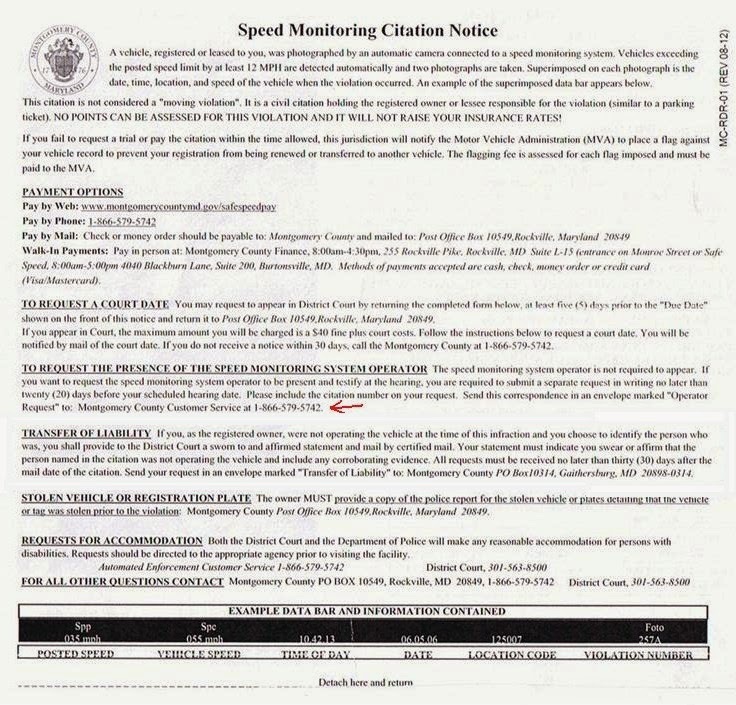 In 2014, Richard Harrison, the program manager and "local designee" for the Safe Speed Program, confirmed the error and stated to the Maryland Drivers Alliance in July of 2014 that the address would be corrected. Harrison, who rejected the commonly used term "ombudsman" to describe his duties, asserted without proof that no individuals were denied their right to face the operator due to this issue. In reality there is no way of knowing whether some motorists did not exercise their right to request the Operator's testimony because incorrect instructions were provided. The issues were uncovered by a member of the Alliance who disputed a citation and who was ultimately found not guilty by the circuit court. The defendant in this case recognized the error, but nevertheless mailed a request to the address shown on the citation, precisely as shown. Not surprisingly the letter was returned by the postal service "address unknown". However the defendant in this case was an expert on speed camera law and was unusually familiar with the County's program, he was able to determine the correct address to which the "Operator Request" needed to be sent, and did send such a request. However upon appearing in District Court and requesting to cross examine the operator, who did happen to be present in the room, and presenting the court with a copy of the request and a certified mail receipt, the district court judge refused to permit "you don't need to testify" the judge told the Operator. The right to confront an individual providing testimony against a defendant has been upheld by the US Supreme Court. Unfortunately, this was not respected by the District Court in this case, and the defendant was unable to confront the operator, and thus unable to present questions to her about the "daily setup logs" she had signed as the defendant has intended. In this case the defendant appealed the citation to Circuit Court. The fact that this entailed paying a non-refundable fee which was twice the cost of the original fine, plus hundreds of dollars in other expenses, is the main reason only a handful of speed camera cases have ever been appealed above District Court. Prior to the circuit court hearing, the defendant repeated sending the request in the same way, one copy to the "address" shown on the citation, and one to the correct address. Once again the letter sent to the "address" on the citation was returned address unknown. "Q: Would You say the cameras are as accurate as these logs?" fork to verify that the system is working correctly. MR. STEVENSON: Can she finish her answer? THE COURT: Had you finished your answer? MS. LITTLE: Yes. No. I'm not finished yet. And how we -- and the using level that it's set to to operate the CIT2 software that also assists in operating the fixed camera unit. Q Okay, and did you certify that item according to the log? Q Is there an SL next to that item on the log? A Well, on number five? Q Next to number five, yes. A No, but there's an SL everywhere else. Q Okay. Yes, that is interesting. What -- could you please read the description of the task for number seven? A There's nothing there on number seven. Q -- according to the log? A I'm not responsible for printing out the deployment -- when I see these deployment logs on the computer, we have a button there that says that verify and check that everything was checked. How it's printed out I have nothing to do with that, but before I save this log it usually tells me that it's missing my initial or anything else." It is unclear how many camera logs contained these defects, or for what period of time they were issued. However the defendant in this case had requested all daily setup logs for the camera locate 19600 Blk of Georgia Avenue from May 15, 2013 – May 21, 2013, and all logs provided contained the same error. To the best of our knowledge, Montgomery County has not issued any refunds for citations issued with these daily setup log errors. Montgomery County spent taxpayer money going to court to uphold the principal that paying a citation is an admission of speeding, and therefore that a local government cannot be sued to force the refund citations for any reason whatsoever. 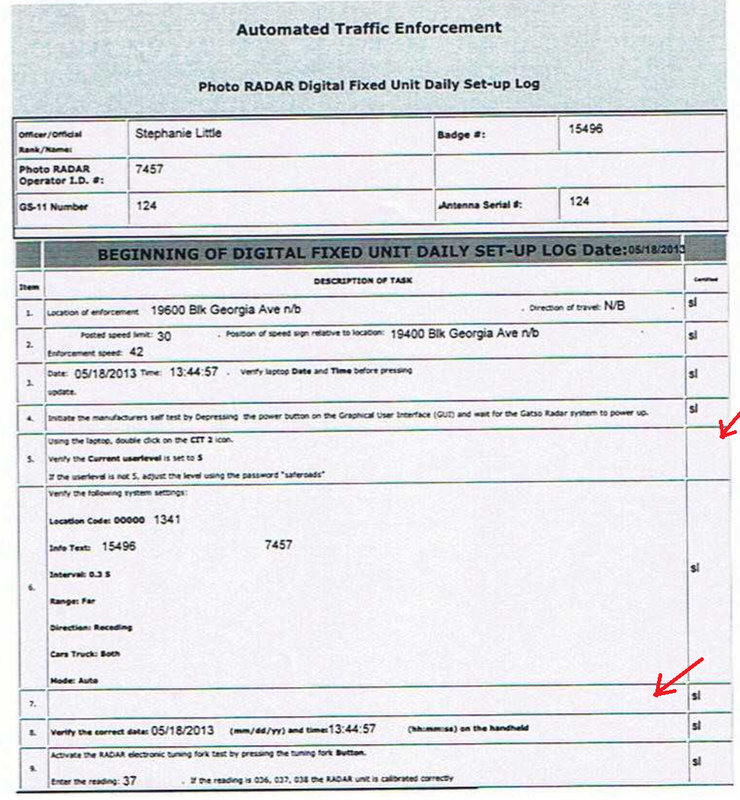 The defect demonstrates that printed copies of "electronic logs" may in fact not authentically reproduce what the operators "sign: by pressing a button. Normally "hearsay" evidence is permitted in court, however state lawmakers exempted speed cameras records from hearsay evidence, and define them to be evidence of the violation without the testimony of the "operators" who "signed" them by merely pressing a button (the "signatures" on the logs are also digitally imprinted). However only the the state is exempted from "hearsay" evidence rules... defendants are not permitted hearsay in their defense. In at least one case a circuit court judge has ruled in the past that digital signatures on speed camera citations did not have legal standing. The possibility that electronically reproduced documents may not accurately reflect what was actually "signed" is one argument why electronic signatures should not be sufficient to authenticate a document. Upon questioning of the operator in this circuit court case, the Operator also was did not correctly recall the location of signs in the vicinity. The operator claimed to be very familiar with the area and incorrectly stated that the speed limit south of the camera was marked as 30mph for a full mile, when in fact photographs presented by the defendant showed that the camera was placed near a speed transition zone, about 160 yards from the point where the speed limit dropped from 40mph to 30mph. The circuit court did not rule on these issues in this case, and instead found the defendant in this case not guilty on the basis that state law makes it a defense if you are not the driver. The prosecution had agreed that the defendant in this case was not the driver, and the County attorney furthermore made a statements which implied that the prosecution was aware the defendant was not the driver when they decided to spent thousands of taxpayer dollars prosecuting the case of a $40 ticket in Circuit Court. Montgomery County has a long history of denying the right to face an accuser. In prior years we had received reports that Montgomery County was refusing to present the operators in court even when requested, and the district court was inconsistent in ruling on this. 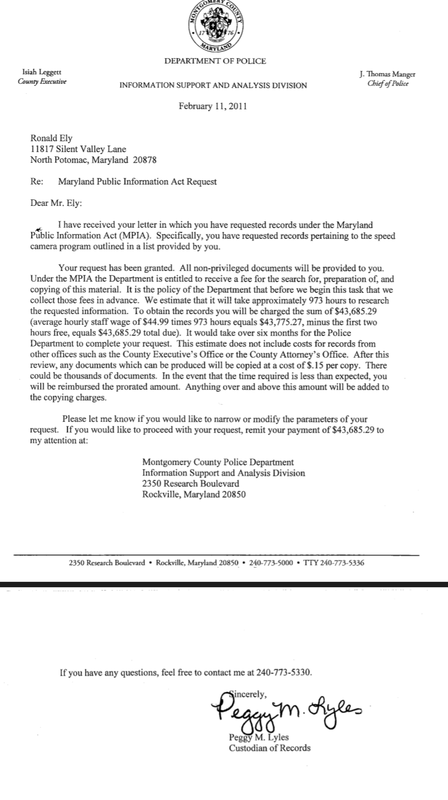 In February 2011, the editor of this website requested documents pertaining to this policy from Montgomery County, and the County Police responded that there would be a $43,685.29 fee merely to begin searching for responsive documents, and a six month delay. The Office of the county executive never responded to request at all and police stated that the $43,000 fee did not include records in the County executive's custody. The county did not cooperate with a request to clarify the reason for the fee so the request could be narrowed. The county never produced the requested documents, but in 2012 County Attorney David Stevenson did send an 11 page long "legal bulls**t" response, which defended the county's policy and failure to produce records. "When you presented your inquiry in December 2010, it was the position of the Police Department that in the class of cases identified above, a speed monitoring system operator was required to be presented in court, but the speed monitoring operator in court didn't have to be the speed monitoring system operator who filled out and signed the daily set up log for the speed monitoring system unit on the day when the unit recorded the person's"
Thus the county at the time felt at that time that it was acceptable to present a person who had no first hand knowledge of the events in question. It is unclear what the county's current position is. In the 2014 "so called reform" legislation which Maryland passed this year, the state actually softened the requirement for speed camera operator logs, such that they no longer need to certify that they performed the tests on the device, but rather. The Maryland Drivers Alliance argued against this change, stating that it created an entirely new level of hearsay evidence and flew in the face of supreme court rulings protecting the right to face the accuser. The head of Montgomery County's automated traffic unit, Captain Tom Didone, has stated that he was a member of the legislative work group which wrote the so called reform bill, and thus the county had substantial input into the wording of the bill.